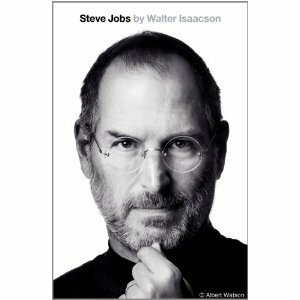 This blogpost will highlight some of my favourite parts of the biography of Steve Jobs by Walter Isaccson – which i think is a brilliant read. I will focus on the parts which epitomize the role of Steve Jobs in building Apple – a company which changed the world. I will also pick out nuggets of business data which leap out of the pages to give context to the story. Apologies about the long length of this blogpost but the book is over 600 pages of wonderful stuff. This is a book about the roller-coaster life and seemingly intense personality of a creative entrepreneur whose passion for perfection and ferocious drive revolutionized six industries: personal computers, animated movies, music, phones, tablet computing, and digital publishing. You might add a seventh, retail stores, which Jobs did not quite revolutionise but did reimagine. Even though Jobs could be demanding, it could be oddly inspiring. It infused Apple employees with an aiding passion to create groundbreaking products and a belief that they could accomplish what seemed impossible. The results were phenomenal. In 1977 when Apple was set up it was worth $5,309. In 1980, it was worth $1.79 billion. The book refers Jobs ‘reality distortion field’ where Jobs would look at the world and interpret it the way he wanted. He ignored facts that did not suit him and thereby seemed to bend reality to his will. The launch of the MAC in 1984 highlighted the beauty of this approach. The MacIntosh was due to start to start shipping on Monday, January 16. One week before that, the engineers concluded that they could not make the deadline. They needed an additional two weeks. The project had already taken a very long time. Jobs was in New York getting ready for Press previews. He was told on a Sunday morning conference call. There was a pause. Jobs did not get angry; instead he spoke in cold, somber tones. He told them they were really great. So great, in fact, that he knew they could get this done. Jobs reiterated the deadline. The deadline was met. He had pushed the team to do what they had thought impossible. The 1983 story of the CD Drive for the MAC illustrates an occasion when a direct order from Jobs was ignored. He decided in January that Apple would work with Alps to produce their own drive. After a visit to Toyko the engineering team was ordered to cease all work with Sony. However, they decided to bring a Sony engineer on site to work on integration of their drive as Plan B. The guy had to be told to hide every day when Jobs visited the lab. In May, Alps admitted that it would take at least 18 months to get their clone of the Sony drive into production. The team then told Steve what they had done. Their prudence had effectively saved the day. Steve swallowed his pride. As they turned out to be right, he appreciated their renegade attitude and willingness to ignore authority. One of Job’s favourite maxims was: “The journey is the reward”. The Mac Team he liked to emphasise was a special corps with an exalted mission. In September 1982 Jobs had a retreat with fifty or so members of the MAC division. One of the thoughts he put on an Easel was ‘Don’t Compromise’ which instilled the importance of design and quality into the team. At the end of the presentation someone asked whether he thought they should do some market research to see what customers wanted. “No,” he replied, “because customers don’t know what they want until we’ve shown them.” Then he pulled out a device that was about the size of a desk diary. “Do you want to see something neat?” When he flipped it open, it turned out to be a mock up of a computer that could fit on your lap, with a keyboard and screen hinged together like a notebook. “This is my dream of what we will be making in the mid to late eighties,” he said. They were building a company that would invent the future. Later in the book, the topic is revisited. From 1997 Jobs instigated and led the biggest corporate turnaround in history. As he was returning to Apple he presented in August at Macworld in Boston to an exuberant audience. He delivered a presentation on why Apple’s Sales had fallen by 30% in the previous two years. “There are a lot of great people at Apple, but they’re doing the wrong things because the plan has been wrong,” he said. “I’ve found people who can’t wait to fall behind a good strategy, but there just hasn’t been one.” The crowd again erupted in yelps, whistles and cheers. And the results of innovation feature throughout the book. The App Store for the iPhone opened on iTunes in July 2009, the billionth download came nine months later. By July 2011 there were 500,000 apps for both the iPhone and iPad. The iPad took less than one month to reach one million unit sold (twice as fast as the iPhone to reach that mark). By March 2011, nine months after its release, fifteen million had been sold – the most successful consumer product launch in history. The Apple Brand was all important to Jobs. The book recounts the development and success of the 1984 advert and The Think Different Campaign in 1997. The Think Different campaign was a brand image campaign not a set of advertisements featuring products. It was designed to celebrate not what the computers could do, but what creative people could do with the computers. The print ads featured a black and white portrait of an iconic historical with just the Apple logo and the words ‘think different’ in the corner. The faces were not captioned. The branding of Apple was based on a deep understanding of customers. We learn that Jobs held a freewheeling three hour meeting every Wednesday afternoon with his top agency, marketing, and communications people to kick around messaging strategy. By sharing with his marketing gurus his passion for the products as they were being created, he was able to ensure that almost every ad they produced was infused with his emotion. If Apple is going to succeed, we’re going to win on innovation. And you can’t win on innovation unless you have a way to communicate with customers. The Stores were an unbelievable success. Manhattan’s Fifth Avenue Store opened in 2006. Open 24/7 it vindicated the strategy of finding signature high traffic locations by attracting fifty thousand visitors a week during its first year. The store grosses more per square foot than any store in the world. Jobs was very proud that the Store grosses more in absolute dollars than any store in New York – more even than Bloomingdale’s. Apple and Jobs were renowned for their signature product launch events which generated unprecedented and invaluable buzz around the products. The iPod was launched on October 23, 2001. “Hint: It’s not a Mac,” the invitation teased. When it came time to reveal the product, after he described its technical capabilities, Jobs did not do his usual trick of walking over to a table and pulling off a velvet cloth. Instead he said, ‘I happen to have one right here in my pocket.’ He reached into his jeans and pulled out the gleaming white device. “This amazing little device holds a thousand songs, and it goes right in my pocket.” He slipped it back in and ambled offstage to applause. In 2004, U2 were trying after almost 30 years to reinvigorate its image. It had produced an exciting new album, ‘How to dismantle an Atomic Bomb’. Bono knew that he needed to create some traction so he placed a call to Jobs to ask him to use the song Vertigo in an iPod tv commercial for free. Bono wanted U2 to have their own iPod. He wanted a black one. Apple only used white but Jobs agreed. The album sold 840,000 copies in its first week. There was a very insightful comment in the book, ‘What was remarkable was that associating with a computer and electronics company was the best way for a rock band to seem hip and appeal to young people’. Jobs unveiled the iTunes Store in April 2003. This followed extensive negotiations with the Record Labels to create a product offering that would compete with services which offered songs for free. It was predicted that Apple would sell a million songs in its first six months. Instead the iTunes Store sold a million songs in six days. The key was creating a product offering that worked. Jobs really like Music and the artists who made it. He was opposed to what he saw as the theft of creative products. He knew that the only way to stop piracy was to offer an attractive alternative. The key to concluding negotiations with the Music Labels was getting the business model right. Jobs proposal was to sell digital songs for 99 cents – a simple and impulsive purchase. The record companies would get 70 cents of that. He rejected the monthly subscription model preferred by the music companies. He also proposed that iTunes would only be available to Mac users a mere 5% of the market – this was very attractive in reducing the perceived risk. Jobs had a penchant for disruptive business models. The iPad and other app-based digital devices heralded a fundamental shift in the digital world. Its success in terms of offering more to consumers is evidenced by the fact that by June 2011 Apple had paid out $2.5 billion to app developers. One of Jobs’s great strengths was knowing how to focus. ‘Deciding what not to do is as important as deciding what to do,” he said. ‘That’s true for companies, and it’s true for products.’ When Jobs returned to Apple he reduced the product portfolio to 4 products and drew a matrix with four quadrants to communicate the new focus. Apple’s sharper focus meant getting the company out of other businesses, such as printers and servers. In 1997, Apple was selling a Sytlewriter colour printers that were basically a version of the Hewlett-Packard Deskjet. They were shipping a million each year but made no money. HP made most of its money by selling the ink cartridges. To embed the Apple style of decision making into its culture, Jobs started an in-house centre called Apple University. He hired the dean of the Yale School of Management to compile a series of case studies analyzing important decisions the company had made, including the switch to the Intel microprocessor and the decision to open the Apple Stores. Top executives spent time teaching the cases to new employees. The book was written following over 40 interviews with Jobs and the people who mattered most in his story. His own thoughts are periodically inserted directly. He has an interesting philosophy on money. I never worried about money. I grew up in a middle class family, so I never thought that I would starve. And I learned at Atari that I could be an okay engineer, so I always knew that I could get by. I was voluntarily poor when I was in college and in India. So I went from fairly poor, which was wonderful, because I did not have to worry about money, to being incredibly rich, when I also didn’t have to worry about money. After going public with Apple in 1980, Jobs aged 25 was worth $256 million. Fast forward to 1995 to the public offering of Pixar. The 80% of the company that Jobs owned was worth $1.2 billion. The final chapter is both poignant and uplifting in celebrating Jobs life. Isaccson wraps up the book brilliantly – the bullet points of achievements on page 566 are incredible. The ending is really clever but i wont spoil it on you. Suffice to say that he leaves the last word to Jobs. My recommendation is definitely read this book – i really enjoyed it. always I hope you enjoyed this post. Comments welcome.